Maximum size: about 40 mm. 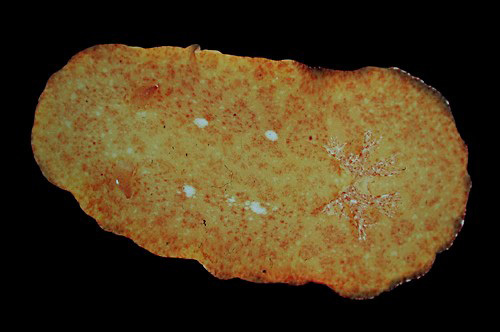 Natural history: Platydoris sp. #2 is a rare species on Maui with only two animals found at 3.6-5 m (12-16 ft) at moderately protected to moderately exposed rocky sites. However, Scott Johnson found it a number of times at highly exposed sites on Oahu and reports it as being common at Kure. A young animal was dredged from about 100 m (328 ft) off Oahu by Terry Gosliner indicating a much greater depth range. Distribution: Big Island, Maui, Oahu and Kure. Taxonomic notes: First recorded in Hawaii at Makua, Oahu by Scott Johnson on Feb. 15, 1978. Photo: PF: 30 mm: found by CP; Napili Bay, Maui; Oct. 8, 1994. Note 1: Lumping the dredged animal with this species is supported by the arrangement of patches, the presence of small dark spots in the centers of some patches and the spotting on the branchia. However, the overall hue is different (unless it's a product of photo lighting/processing?). So, it should be viewed as tentative.